It had been about 18 months since we'd first traveled to Middle Sparrow Ranch, and about 3 years since I started following them, and watching their progress on Facebook, so when I received a personal invitation to attend their Open House on October 11, 2014, you can bet it was on my calendar and plans were made to go! I was excited to see how they'd grown, and sample some of the new cheese offerings. I remember when I first started following Earle and Alice Boller of Middle Sparrow Ranch, being fascinated by what they were going to do on the farm, which is raising Jersey Cows on open pastures not sprayed with insecticides. 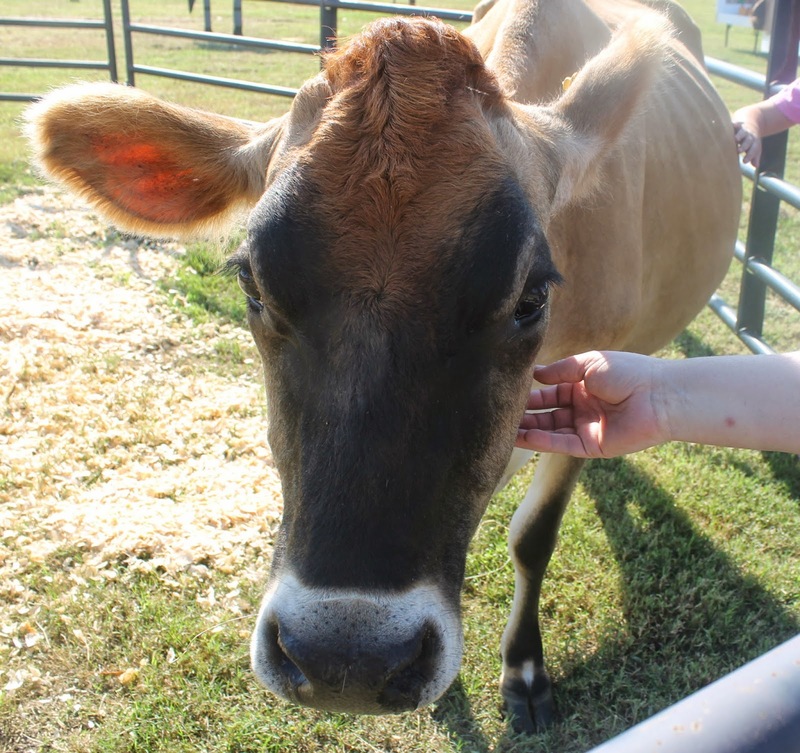 The cows also receive no antibiotics or added growth hormones, but rather are raised completely on pasture, free to enjoy the bounty the farm offers. Earle and Alice milk the cows, bottle the milk and keep some back to make butter and cheeses. 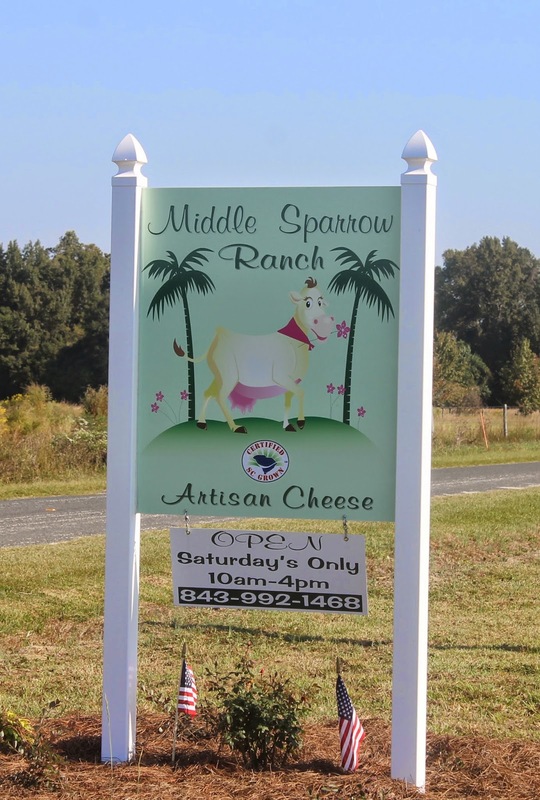 They are licensed, certified, inspected and approved to sell whole, unpasteurized, non-homogenized milk, and as such, Middle Sparrow Ranch is the only dairy and cheese-making farm in South Carolina. Their milk is so rich in butter-fat it is not unusual to see cream on the top 1/4 to 1/3 of a gallon of milk. When's the last time you've seen that when you've bought milk? Additionally, many cheese makers purchase their milk from outside sources, but not Middle Sparrow Ranch. The amazing flavors of their artisan cheeses result from the high quality of milk and the grasses their cows graze on through the seasons. As a result, the cheese may vary in color, or have subtle taste differences throughout the year. 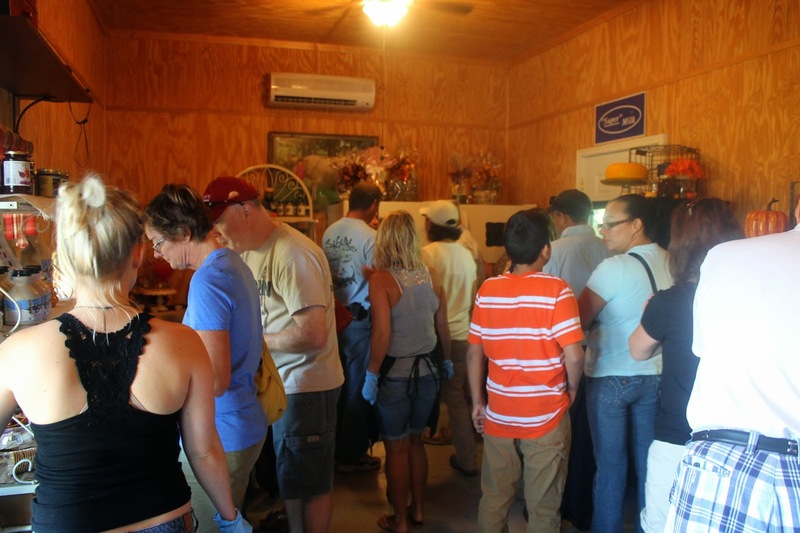 So here we were, anxious to see and taste all the new cheeses, and explore what was new at Middle Sparrow Ranch. We arrived shortly after the opening time of 10 a.m. and they were already packed with people! Some were off to see Miss Fig, the farm's mascot, or check out the other animals. Children were having their faces painted, others were off on a farm tour via horse-drawn wagon rides, and still others were in the cheese room sampling cheeses which was our first stop! Cheese, cheese and more cheese! Oh and milk, butter and cream oh my! Just as we walked in, I spied Alice off to the left behind the cheese sampling table, and I waved. She saw me, put her arms up and came over to give me a big hug! We then talked about all her new cheese creations and proceeded to sample them. There was a "Swamp Brew" which is a beer infused cheese with a craft beer from Southern Hops Brewing Company. Then there was "Goldenrod" which is a Gruyere-type cheese, suitable for melting on French onion soup or using in Reuben sandwiches. 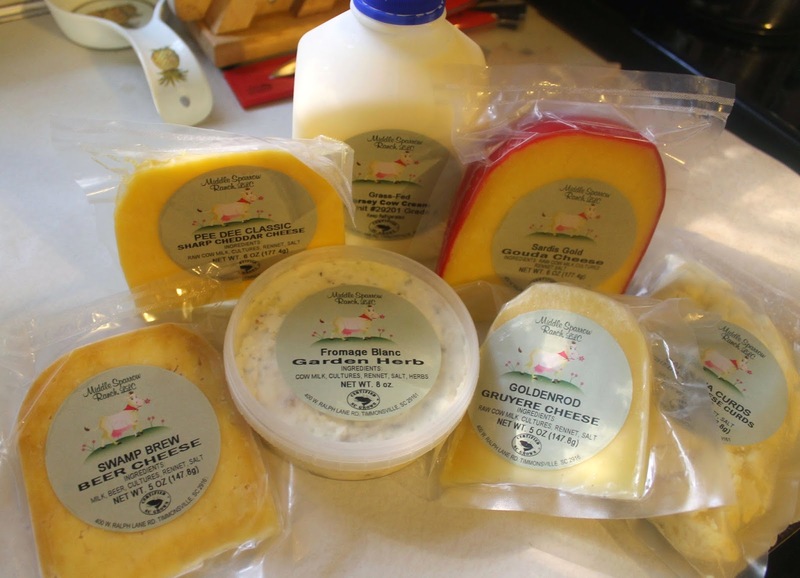 They also had Cheese Curds, a 14-month Aged Sharp Cheddar, Garden Vegetable Fromage, Havarti and many, many others. So many it was hard to choose because I liked them all, but we chose our cheeses, bought milk and cream, and said our good-byes, telling Alice we'd see her again soon. We loaded up the cooler we brought, made sure everything was surrounded by the ice packs in the cooler, and headed out. As we were leaving more and more cars were coming down the road and turning in to park and check it all out for themselves. I know they had a busy, exhausting day, but one that was great for this wonderful farm. Many thanks to Earle and Alice for hosting such a wonderful event and introducing so many others to the greatness that is Middle Sparrow Ranch! 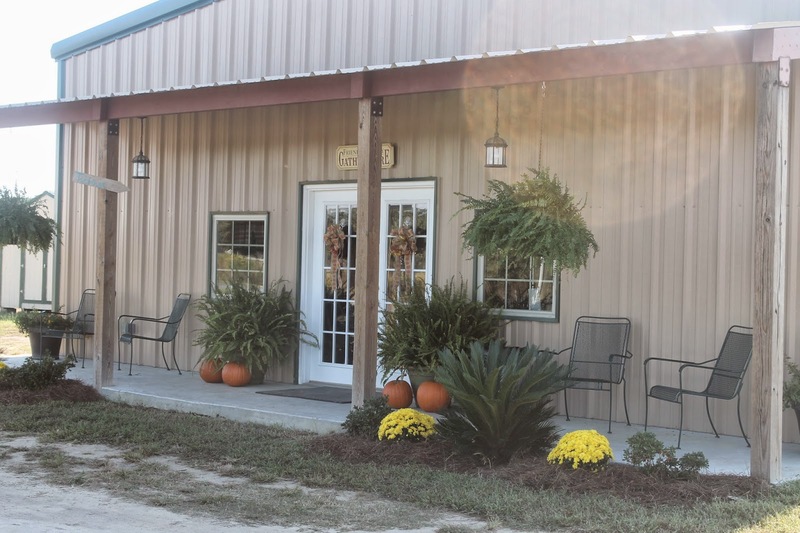 Middle Sparrow Ranch is located at 400 Ralph Lane Road in Timmonsville, South Carolina. You can also find the farm on Facebook or call 843-992-1468. 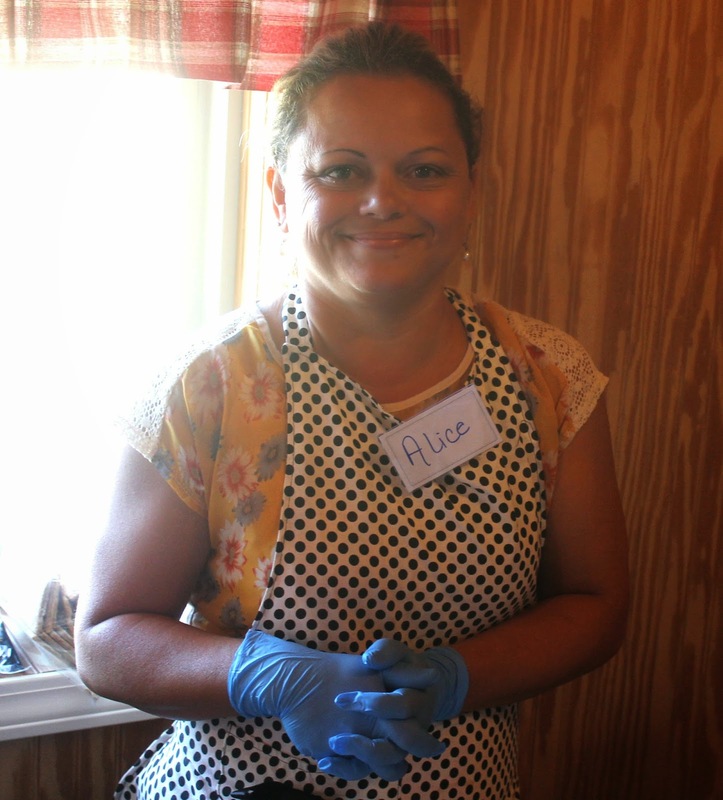 So now we were off to lunch at Tubb's Shrimp and Fish Co. located at 1500 2nd Loop Road in Florence, South Carolina. Only open for business one year, they were already voted the BEST seafood place in Florence and there's no wonder why. Soulful ... Southern ... Seafood. 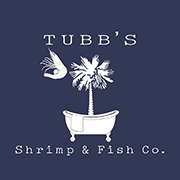 As their mission statement says "Tubb’s Shrimp & Fish Co. will create a sense of community amongst its patrons through the delivery of the freshest local fare. We will introduce Florence to the culinary gifts that our local lands and waters offer. Whether it is prepared in our kitchen or sourced from our fresh market, our customers will be able to take as much pride in our product as we do." Since we were in no hurry, and were waiting on my son and his family to join us, we took our time reviewing the menu and checking out all the great options. One deal we really liked was the Seafood Platter. You have a choice of 1, 2, 3 or 4 entree selections, plus 2 side dishes which seemed like a great option to us. Entree choices included Shrimp, Scallops, Oysters, Flounder, Crab Cake or Chicken Tenders prepared grilled, broiled, blackened or fried. 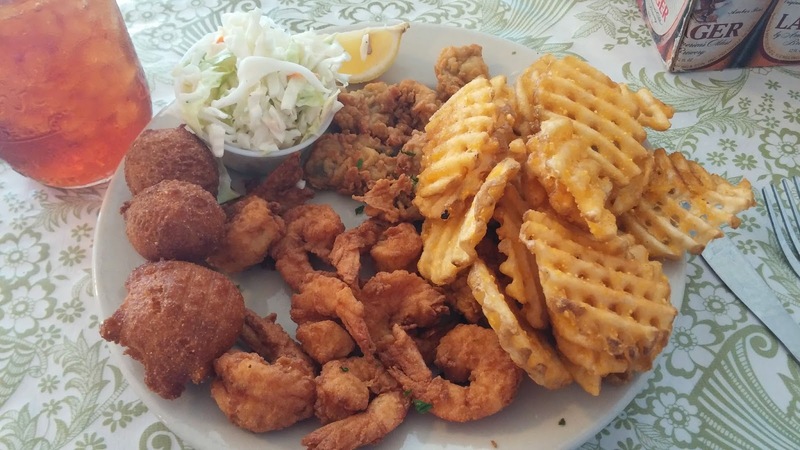 We chose fried Shrimp and Oysters served with crispy waffle fries, hush puppies and nice crunchy cole slaw. 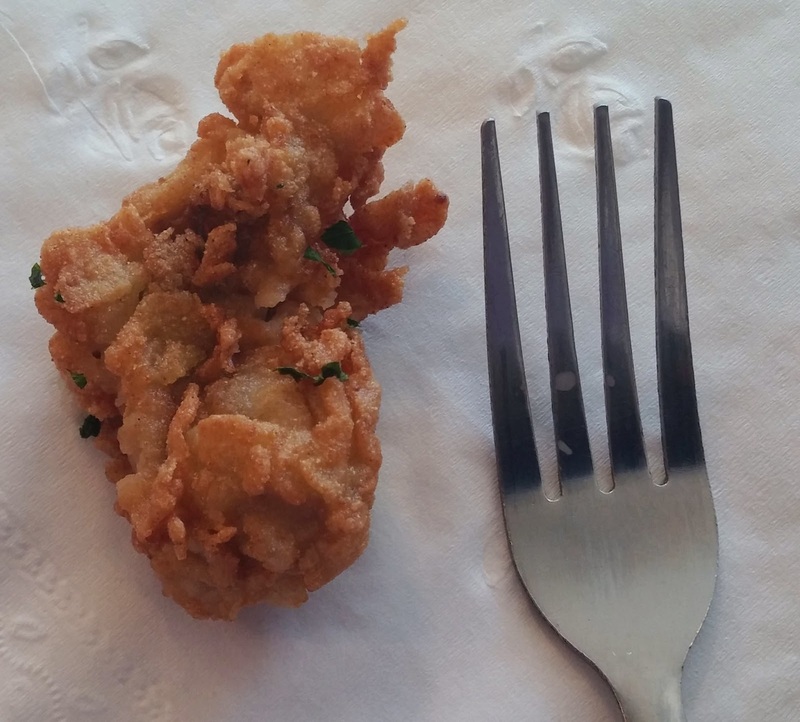 Now first of all, take a look at the size of this oyster! This is the whole oyster, not oyster pieces some places will serve you. Wowee ... we were amazed and the taste ... oh my goodness so darn good. Now look at this platter! It was loaded with food and well worth the $14 it cost us. Yes, you read that right, only $14. 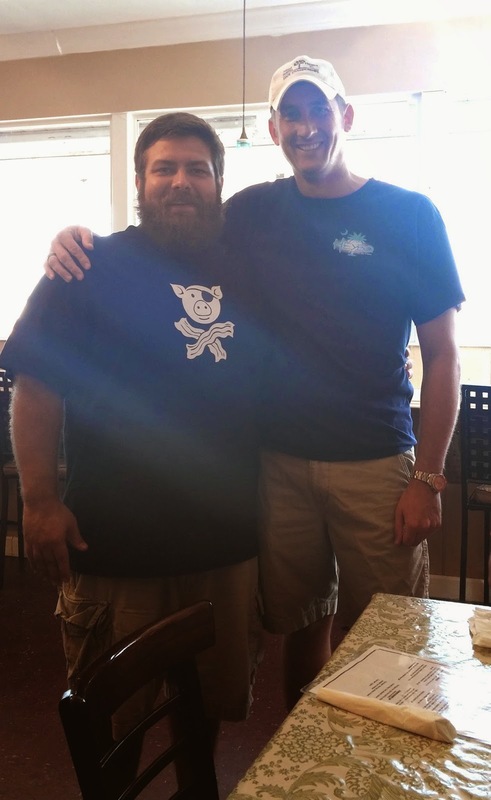 Next, after my son and his family arrived, we were delighted to meet Kyle Hardee, one of the co-owners of Tubb's Shrimp and Fish Company, shown here on the left. He immediately shook our hands, welcomed us to the restaurant and asked if we had tried the She Crab Soup, a recipe from his family. No we hadn't! Next thing we knew, we had 2 small bowls of the soup delivered to our table and it was absolutely delicious. Some of the best I have ever tasted, smooth, creamy, with just the right amount of crab. 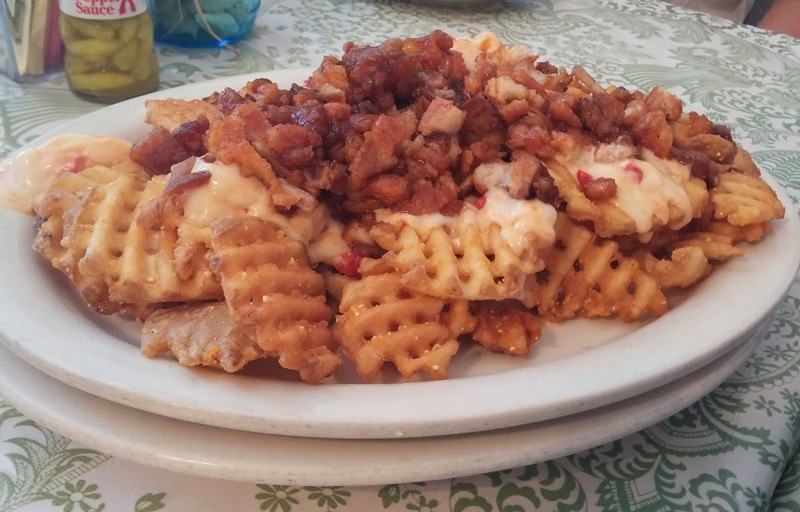 Kyle convinced my son and his family to try the Pork Belly Waffle Fries, which they devoured, then they all ordered a variety of combinations of the Seafood Platter. 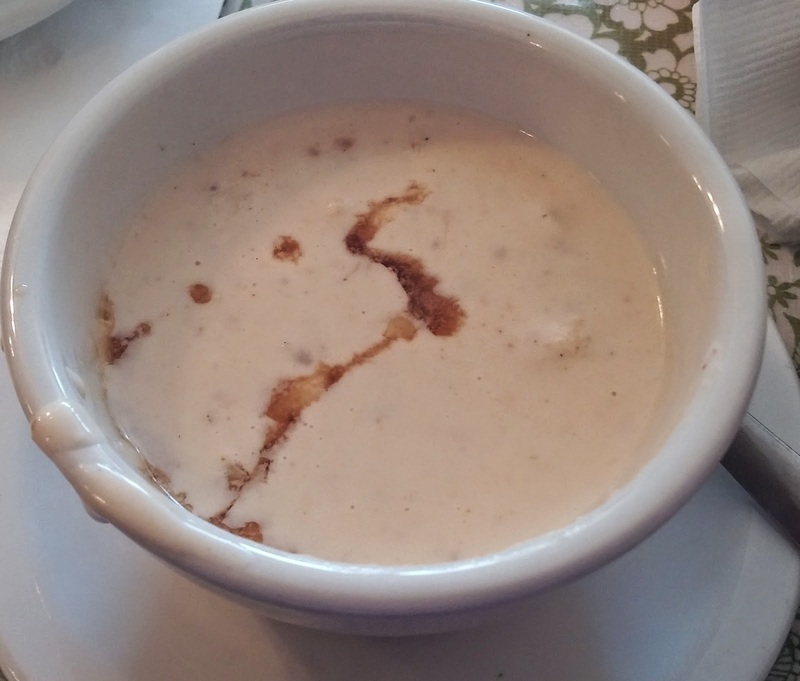 The Tartar Sauce, Cocktail Sauce and Comeback Sauce (Remoulade) are all made in-house. We tried all 3 and they were all fantastic. The full menu is as varied and diverse as there is seafood. There are Seafood Buckets, Shrimp or Oyster Po Boy's, Grouper, Bacon, Lettuce and Tomato sandwiches, Grilled Pimento Cheese, Burgers, Club sandwiches, Shrimp and Grits, and so much more. View their complete menu here, like them on Facebook or call 843-799-5579. After filling up on all this delicious seafood, it was time to say our good-byes and head home. What a great day this had been supporting a local farm and a "sourcing from local" restaurant. I am constantly amazed and grateful for the small, local, family farms and restaurants who are doing it right for you and me. The taste and quality is far superior to anything commercially sold, and well worth the time and money spent in their establishments. Simply put, get out and support local! I think you'll be glad you did!